Amazingly, against all advice and warnings about internet crazes, people still feel the whip their cameraphone out and film themselves doing something ill-advised, thereby creating a permanent reminder of their idiocy. Gone are the days when eating a teaspoon of cinnamon was extreme enough, now it’s all eating poison, burning yourself or jumping out of moving cars. Again, please do not do these so-called ‘challenges’, even if you seemingly succeed in your attempt, you have ultimately failed in succumbing to a pointless online craze. Most of the time though, to the delight of smug viewers like myself, these challenges end in failure. Painful, hilarious failure. Take Jaylen Norwood from Florida, for example. 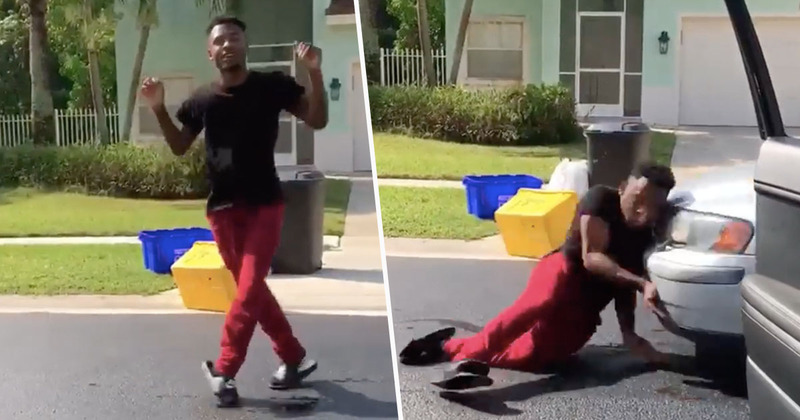 He decided to throw his hat in the ring and take up the ‘In My Feelings’ challenge, also known as the ‘Kiki challenge’, by jumping out of a car and dancing, as it continues to roll down the street. While Jaylen sensibly opted for the safer choice of jumping out a stationary car, he failed to check the road itself. I planned this whole thing out. I was gonna do the dance and then jump on the hood of the car and continue the dance but it came too fast and I slipped on the oil and that’s why I got hit by the car. Thankfully, Jaylen escaped with just a few scrapes on his arm. The viral challenge, which has seen people falling out of moving cars and getting hurt, even prompted the National Transportation Safety Board to issue a statement addressing the dangers. Hopping out of a moving vehicle or jumping into lanes of traffic to show your dance moves is foolish and dangerous — to you and those around you. There’s a time and place for everything, but our nation’s highways and roadways are no place for the #inmyfeelings challenge. The craze all started when internet comedian Shiggy first hopped out his car and started dancing to Drake’s In My Feelings, a cut from his latest album Scorpion. However, he later clarified that the challenge is not about getting out of a moving car. Aside from pain and severe embarrassment, the challenge could also land you in hot water with the authorities. In Abu Dhabi, three social media stars were arrested after officials saw them doing the challenge, and said their dancing ‘endangered lives, offended public morals and violated the traffic law,’ according to Billboard. Police in Spain are warning that anyone jumping out of a moving car to do the dance could face criminal charges. While Egyptian police are also warning people could face charges and even up to a year in prison if they are seen disrupting traffic.